Entry : In order to attend, please register to: meenakshi.mahajan@formin.fi . Please note that access to the concert venue can only be granted against an access pass which is issued by the organizers after the registration. 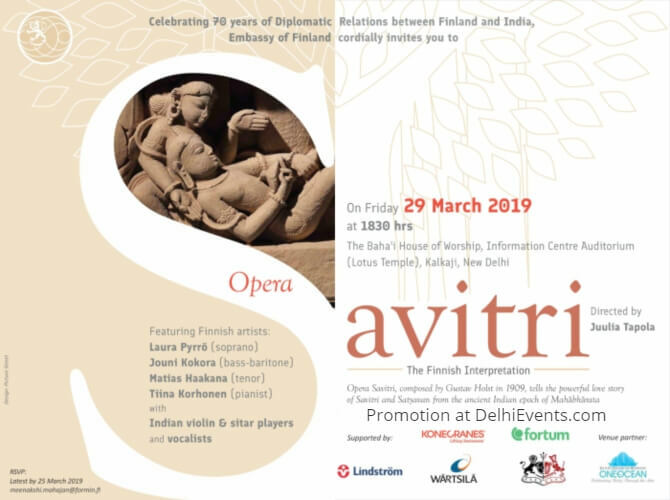 Event Description : MUSIC : Embassy of Finland presents "Opera Savitri" composed by Gustav Holst in 1909, portrays the powerful love story of Savitri and Satyavan from the ancient Indian epoch of Mahabharata. Join us in this celebration to mark the 70 years of Diplomatic Relations between Finland and India! The Finnish interpretation of Opera Savitri is directed by Juulia Tapola and performed by Finnish soprano Laura Pyrrö together with bass-baritone Jouni Kokora, tenor Matias Haakana and pianist Tiina Korhonen. Realized as an Indo-Finnish collaboration, the New Delhi-based Neemrana Music Foundation brings local violin and sitar players and a choir onto the stage.